Coordinating your kitchen cabinets and your flooring can be quite a task. Whether you are choosing materials for your new home’s kitchen, remodeling your current home’s kitchen, or simply enhancing your kitchen with new flooring or cabinetry, the variety of available materials in virtually every color and texture makes the decision difficult. Flooring choices, just to name a few, include tiles, hardwoods, vinyl, bamboo, concrete, and more coupled with a multitude of cabinet choices means you really need to know what you like to make a decision you will be happy with for years to come. You must not only consider your style, but also your needs and of course – your budget. Here are some tips to help you create a beautiful and cohesive kitchen space that is sure to please. 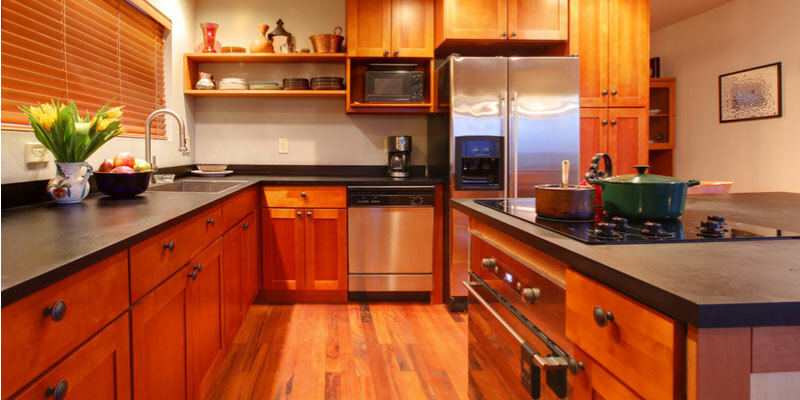 As you work to match kitchen cabinets to kitchen flooring, lighting matters. In fact, lighting should be a factor in helping you make a decision. When you have a small kitchen which lacks natural lighting, you will want to choose lighter hues for all your kitchen elements – from floors to cabinetry and countertops. Incorporating fresh, lighter tones will give your small space a more open and airy feel. If you have a large open kitchen with lots of windows allowing natural light to pour in, you can select darker hues on one or more of the elements – cabinetry, countertops, flooring. To help with your decision making, look online for examples of small kitchen spaces and wide-open kitchens as well as spaces with an abundance of natural light and those lacking natural light. This will help you get a good idea of the options that work best in these spaces with the available lighting. When narrowing down your options, start with the cabinets as the foundation and work outward from there. Keep in mind that contrast keeps things interesting and is an important design element. While dark cabinetry and light countertops are trending at the moment, you may find you want a more classic look with light cabinets and dark countertops. White and off-white traditional cabinet doors like Shaker-style never go out of style and can be paired with everything for a look that works from contemporary to classic. When you have a few favorites in mind, head over to your design center where you can see and touch samples. The designers are there to help as much or as little as you would like and would be happy to send you home with samples of your favorites, so you can “give them a test run” so to speak and make sure they deliver the look you want. Lay everything out in your kitchen space and note how they work together and how they look throughout the day. While you want to make sure your countertops complement your cabinetry and flooring, you also want to be sure your patterns coordinate as well. You don’t want to create a space with busy, hectic patterns, but a relaxing, calm kitchen space to enjoy. After looking at your samples for a few days, you will be able to tell what you love and what you have tired of in only a short time. Along with beauty and style, functionality and convenience are also important deciding factors. For example, you may love the look of granite, but did you know quartz is also beautiful and doesn’t need to be sealed every few years? On that same note, hardwood flooring is lovely, but doesn’t hold up to kids and pets as well as porcelain or stone tile flooring. When you are making your final choices for cabinetry, countertops, and flooring, always ask about upkeep and options, after all the ultimate goal for your kitchen is style, convenience, and functionality.